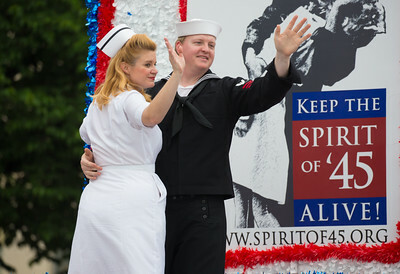 Spirit of '45 spokesman Capt. 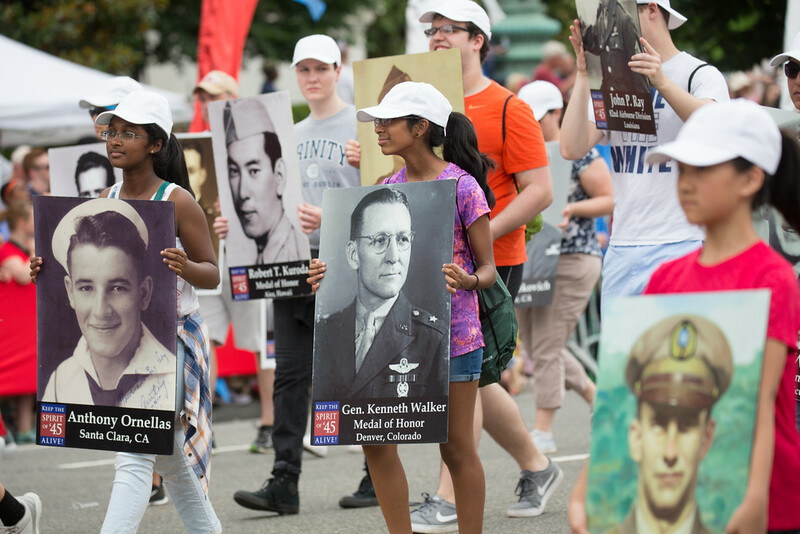 Jerry Yellin, followed by the Keep the Spirit of '45 Alive float (provided by U-Haul International) and more than 200 youth volunteers who marched with poster sized photos of Americans who made the ultimate sacrifice in WWII. Capt. 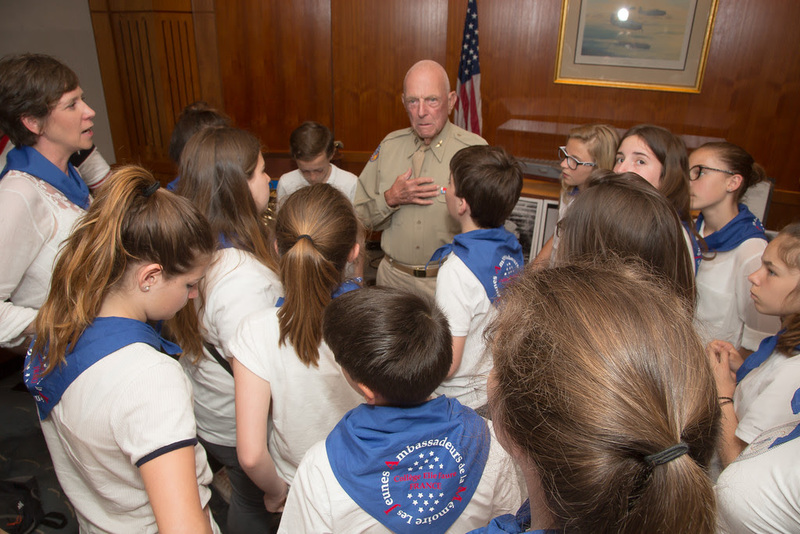 Jerry Yellin talks with middle school students from the Young Ambassadors of Remembrance of the College Elie Faure in France. 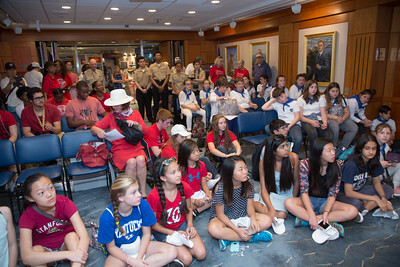 The students met their counterparts from Rocky Run Middle School who have led the Memorial Day March of Heroes for the past five years. Theresa Werner and James Martin congratulated Dr. E. Bruce Heilman on completing his second Ride for America's Gold Star families in May. 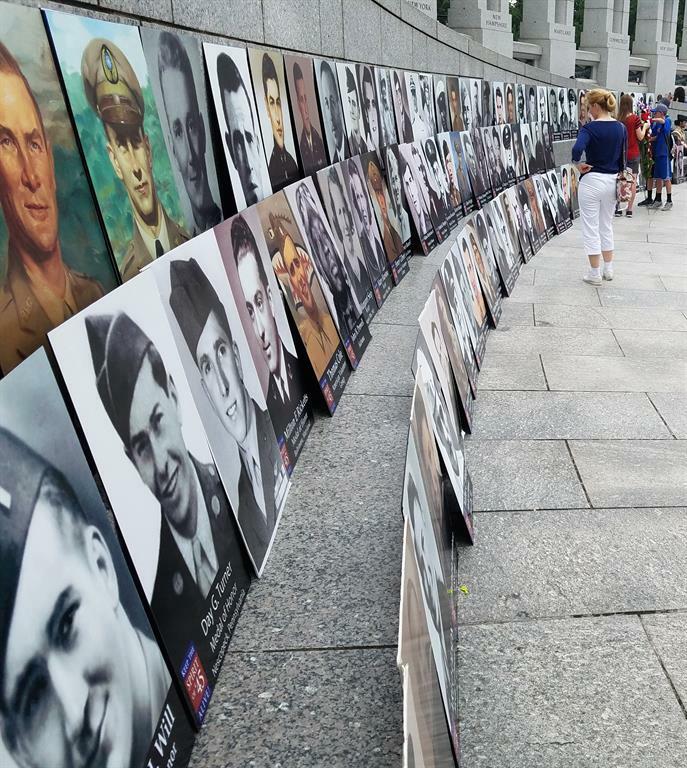 Dr. Heilman rode his Harley more than 6,000 miles to raise public awareness about the upcoming 75th anniversaries of important WWII events. Right, Ashleigh Wagner, Senior Communications and Community Relations Specialist at U-Haul International, which has helped support Spirit of '45 Day since 2010. 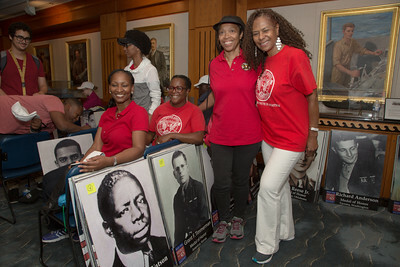 We thank U-Haul International for its continuing support! 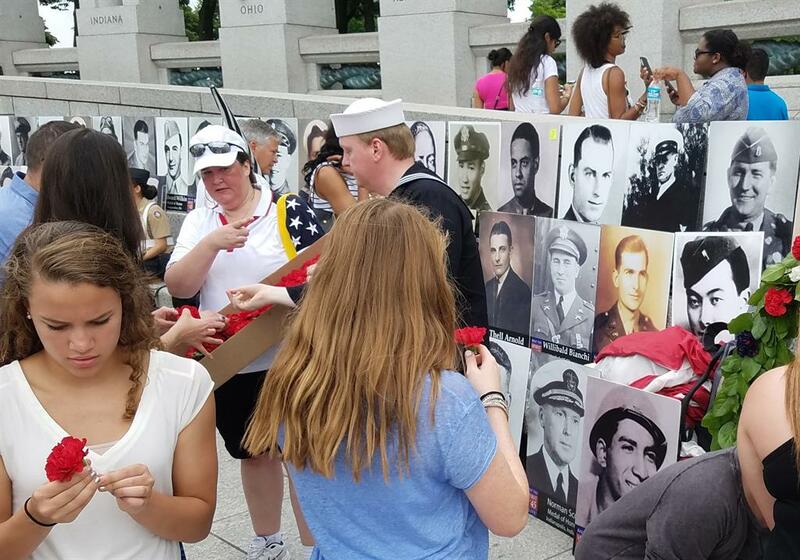 Flags of America's allies and the countries they liberated during World War II. 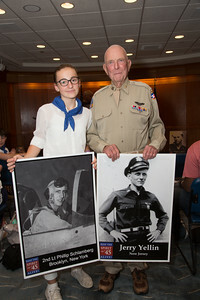 Capt.Yellin salutes the crowd. 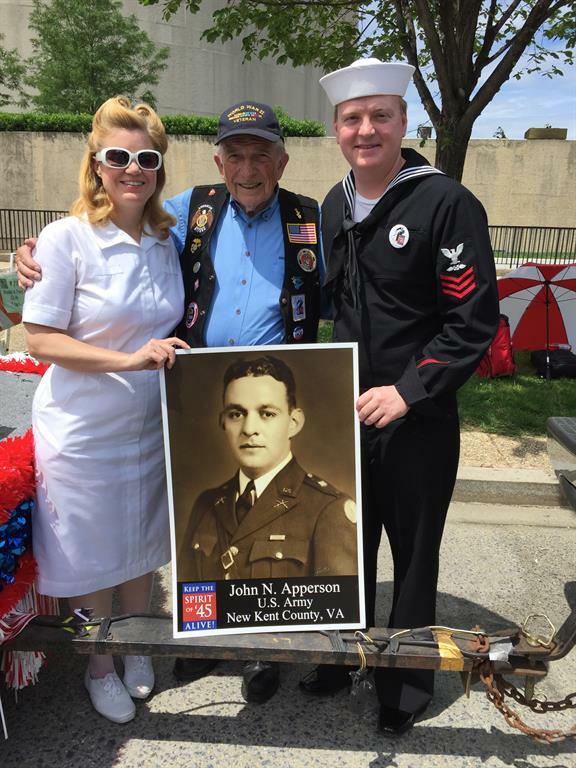 Jerry flew the final mission of WWII on August 14, 1945. His wing man - Phil Schlamberg from Brooklyn, NY, who was lost that day, was the last man to die in combat in WWII. Riding with Jerry was Bonnie Haynes whose parents were Combat MASH in England, France and occupied Germany. 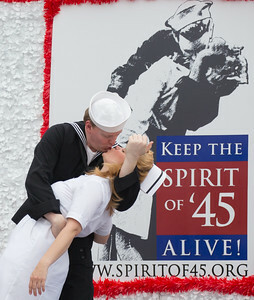 The Keep the Spirit of '45 float features the sculpture by acclaimed artist Seward Johnson sculpture that depicts the famous "Time Square Kiss" of August 14, 1945. 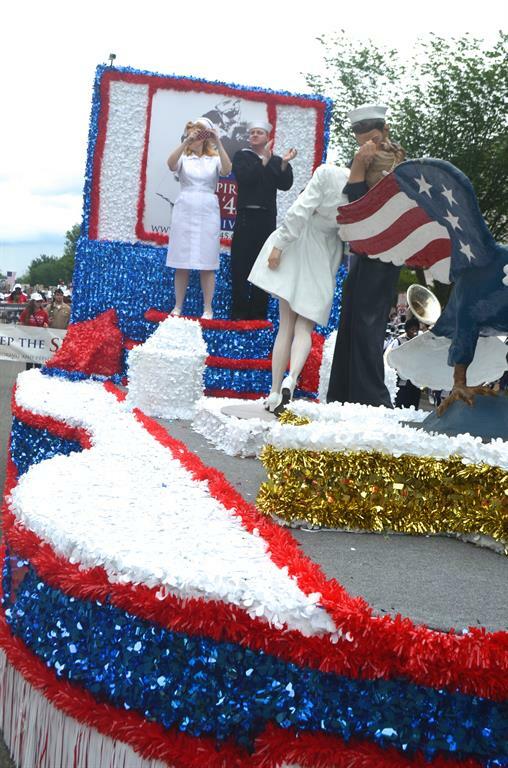 Theresa Werner and James Martin re-enact "the kiss seen around the world." 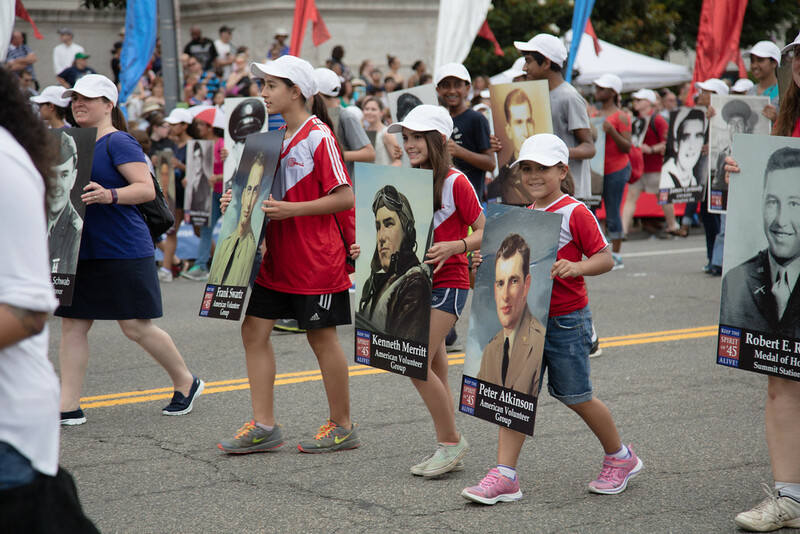 Special thanks to Spirit of '45 corporate partner U-Haul International for providing this outstanding reminder of the homecoming that is earned by every American who serves in the cause of defending freedom and democracy - from WWII to today. 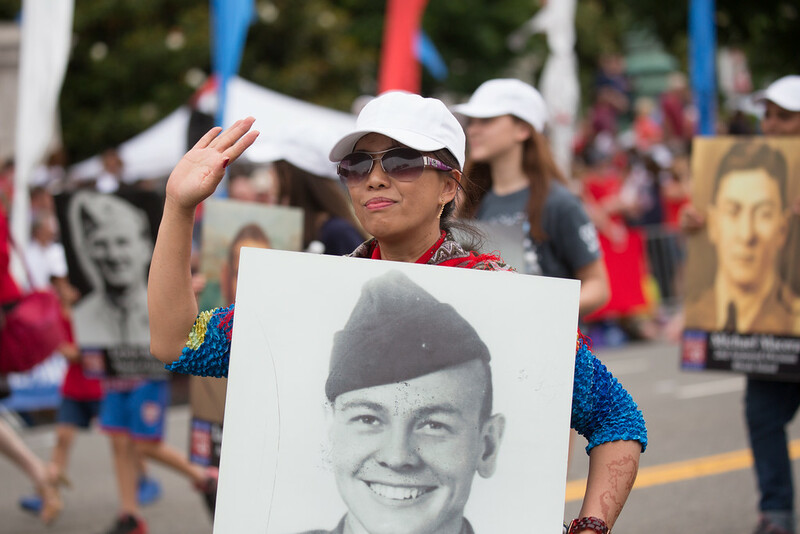 Spirit of '45 representatives from Oregon led this year's Memorial Day March of Heroes. 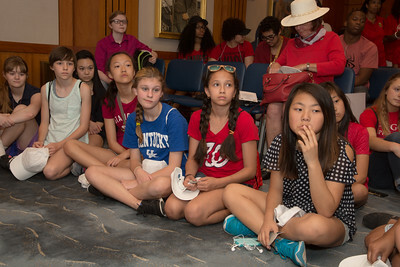 Right to left, Barb Jensen, Spirit of '45 Oregon State Representative, student leaders Anna Tinseth, Landen Van Dyck and Victoria Jacoby, and Spirit of '45 Education Advisor Gail Downs. 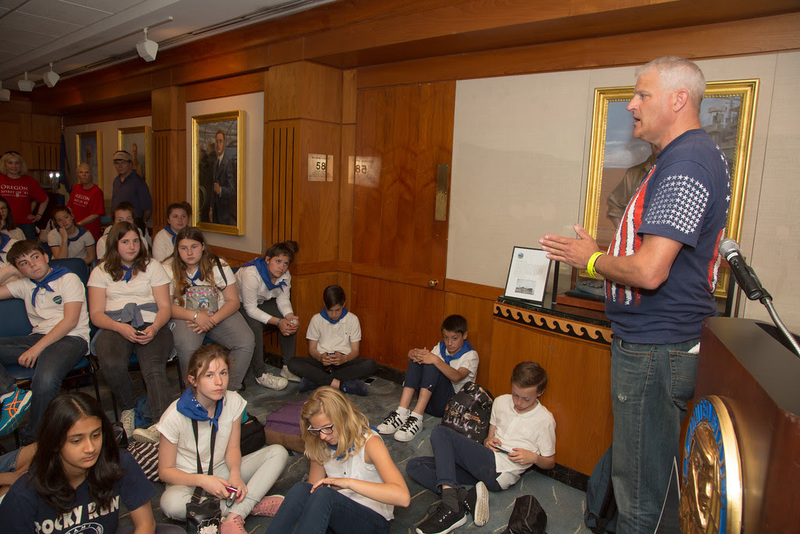 The students raised their own money to pay for the costs of their trip to Washington, D.C. this year. 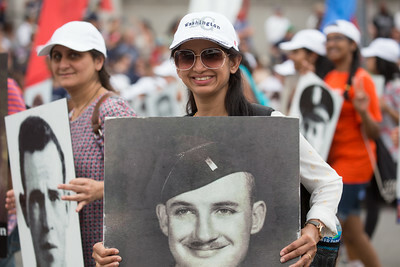 Below, marchers carry a banner comprised of the photos of the Airmen who made the ultimate sacrifice defending American bombers during WWII, and a photo of Spirit of '45 Day spokesman Dr. Roscoe E. Brown Jr.
Students from the Young Ambassadors of Remembrance of the College Elie Faure in France carried photos of some of the more than 2,000 who died in the attack on Pearl Harbor on December 7, 1941. 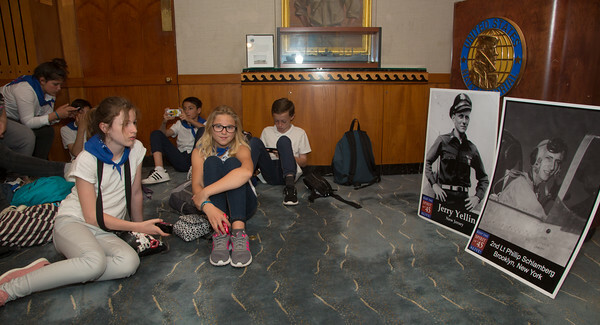 The students were in the U.S. to pay tribute to the Americans who died fighting to liberate France during WWII and to show solidarity with U.S. youth in the cause of fighting against the threat of terrorism. 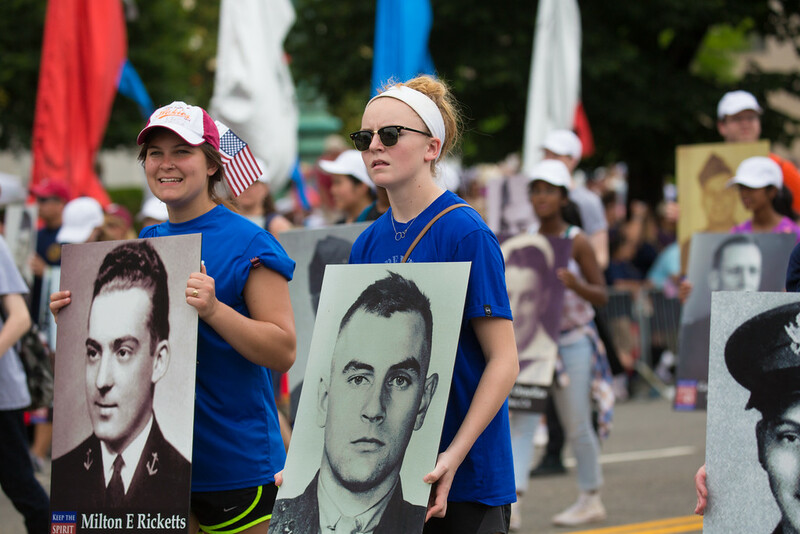 Students also carried the photo of Hollywood legend and Academy Award winner Ernie Borgnine, who served in the US Navy from 1935 to 1945, and is the voice of the USS Arizona Memorial in Pearl Harbor. 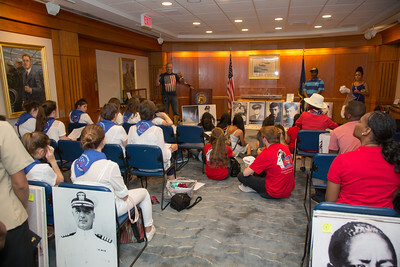 Ernie was the national spokesman for the Stories of Service, which mobilized youth to help WWII veterans produce mini-movies that received 3 medals from the Smithsonian Institute. 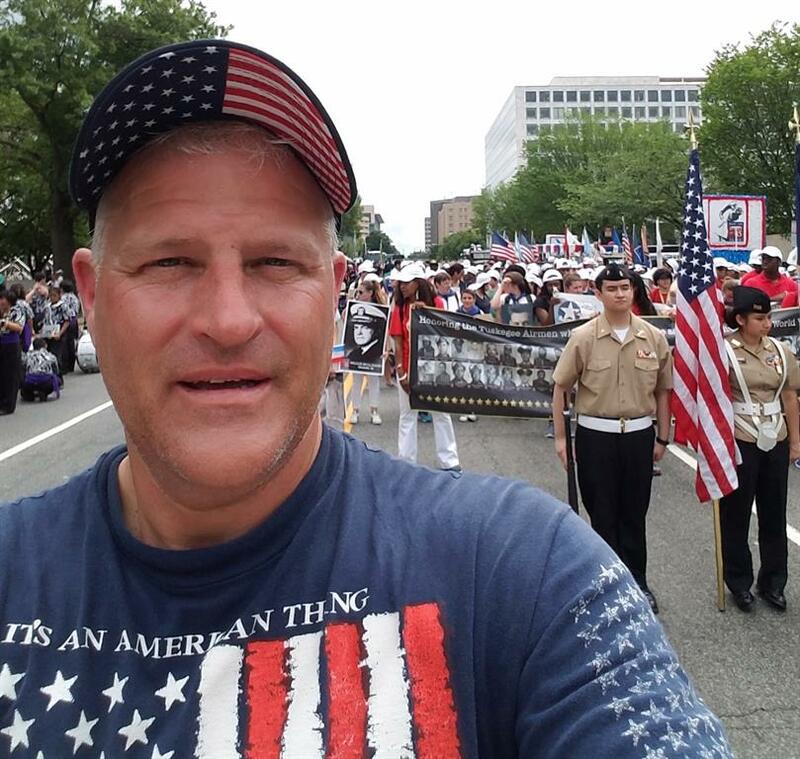 In 2009, Ernie led the Spirit of '45 entry as the grand marshal of the Memorial Day Parade, to begin a grassroots campaign that culminated in Congress voting unanimously for an annual national day to honor the spirit of national unity and shared responsibility that were the hall marks of the "unsung heroes" of his generation. Among the WWII Gold Stars honored this year were Admiral Isaac Kidd, who was killed during when bombs struck the USS Arizona on December 7, 1945, and all 266 of the posthumous recipients of the Medal of Honor. Also honored this year were Gold Star WASPs who were allowed to be buried in Arlington National Cemetery this year. 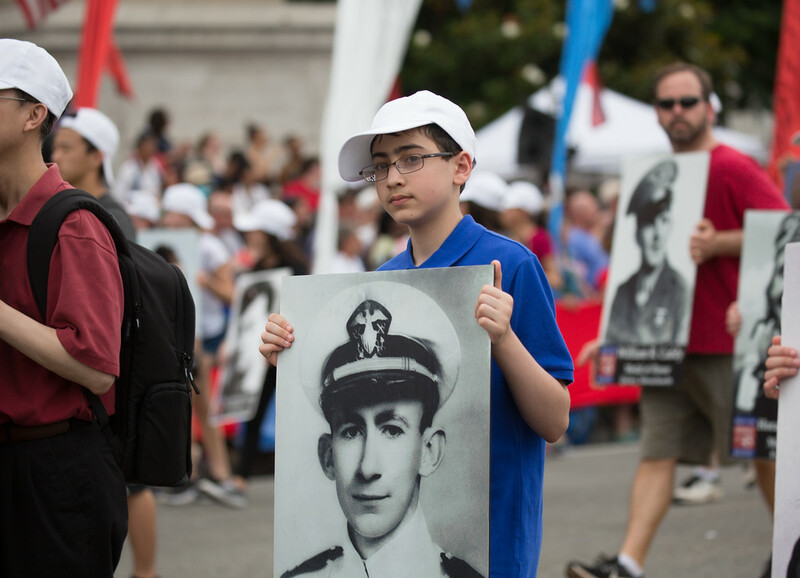 More than 100 marchers came from Rocky Run Middle School in Chantilly, VA, led by Jamie Sawatsky, a Spirit of '45 Day National Leader who has helped recruit students for the Memorial Day of Service program every year since 2010. 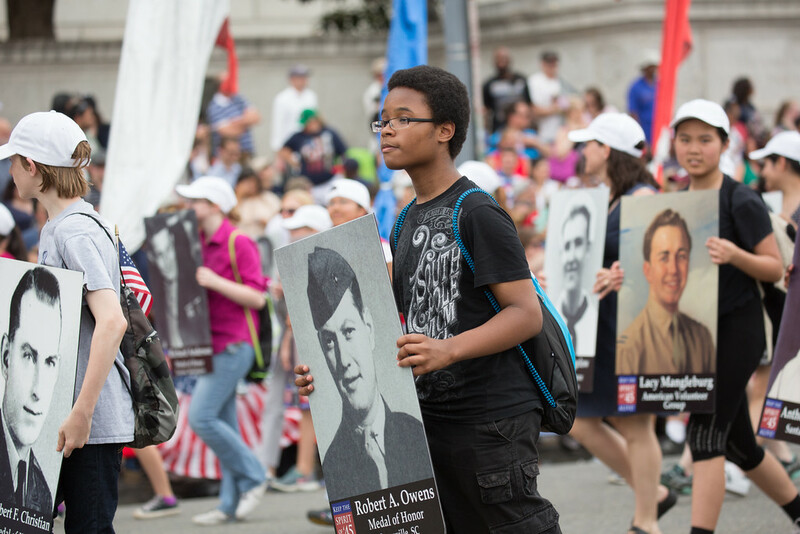 Cole encourages the Marchers as they walk the 10 blocks of the Parade route down Constitution Avenue to place their Hero's photo in the National World War II Memorial. 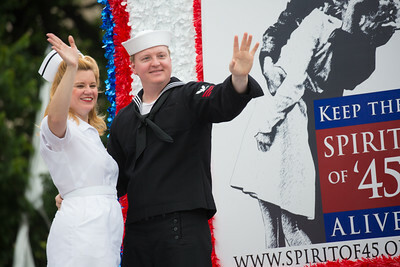 Theresa and James pass out red, white and blue flowers to the public to place in the Spirit of '45 wreath, continuing a tradition that has been taking place on every Memorial Day since 2010. The wreath and flowers were donated again year by Bryan Allison of Murphy Funeral Homes, a Dignity Memorial provider and member of "We Honor Veterans," a joint venture of the VA and the National Hospice and Palliative Care Organization.